What type of editing do you need? In early 2014 I attended (and accidentally helped lead) a freelance editing panel at ConFusion. The indie authors understood they probably needed an editor to move forward, but they weren’t entirely sure what they’d be paying for. It became clear that each of us—aspiring authors and seasoned editors alike—defined editing differently. “What’s the difference between copy editing and proofreading?” someone asked. “Is line editing the same as developmental editing?” Further, “How do the needs of self-published writers differ from those determined to publish traditionally?” We easily could have sat in that stuffy conference room for another hour. Let’s be real—the editing process is a costly endeavor. It’s crucial that you understand what you need—and what you’re getting—so that you can grow your prose and spend your resources effectively. There are three major types of editing: developmental (or line) editing, copy editing, and proofreading. Developmental editing focuses on the big picture: structure, pacing, characters, style, and setting. A developmental editor will ruthlessly rearrange your work, remove entire chapters, query your characters, or flag gaping plot holes. This editor will generally communicate with you on an ongoing basis to ask questions or request feedback. The goal, here, is to ensure that each major story element contributes to and aligns with the writer’s intent. When I’m performing a developmental edit, I’m focusing less on grammar and style and more on how you can improve the shape of your story. Would my novel benefit by switching point-of-view (e.g., first person to third-person limited)? Would my story be more interesting or meaningful if I switched a character’s race, gender, or sexual preferences? Do I have friends and family willing to function as beta readers? Are any of my scenes out of order? Have I sat down and outlined my manuscript, chapter by chapter, to look for plot holes or inconsistencies? Can I send my outline and summary for review rather than the entire manuscript? Am I willing to make substantial changes to my work based on an editor’s feedback? Copy editing takes place after you’ve nailed down big-picture concerns and focuses on sentence-level improvements. A copy editor will recast awkward passages, evaluate your dialogue tags, suggest alternative word choices, and point out when you accidentally change your character’s eye color mid-story. They ask (and research) whether you meant Washington, MO or Washington, D.C., or whether your hero is wielding a halberd or a naginata. To make it easier for writers, I break copy editing down into three categories: light, medium, and heavy. Light copy editing includes correcting faulty spelling, grammar, usage, and punctuation, as well as checking specific cross-references. Medium copy editing includes the above tasks as well as editing for parallel speech, checking idioms, ensuring chapter heads reflect content, enforcing consistent style and tone, flagging awkward passages, and tracking continuity of plot/setting/character traits. Heavy copy editing includes the tasks described above, but also includes significant editing to eliminate wordiness, suggesting and implementing additions and deletions, and smoothing transitions. 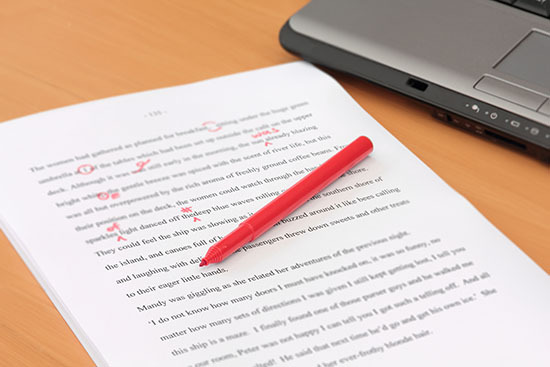 Some editors will incorporate heavy editing into a developmental editing process. If your manuscript is nearing its final stages of revision, you may want a light touch, only marking egregious errors or inconsistencies. If, on the other hand, you’re just finishing a substantial revision, you might need a detailed review. It’s easy to accidentally introduce errors during the revision process, and a copy editor will be able to find (and correct) many of them. Writers seeking to self-publish or traditionally publish will generally benefit from some sort of copy editing. Proofreading is a non-intensive review of a final manuscript to check for typos or other errors that may have been missed or introduced during the editing (or page layout) process. Traditionally, a proofreader views your manuscript in its final form—as an e-book or as a galley PDF. An editor who is proofreading will not rewrite, rework, or rearrange any of your manuscript. The goal of proofreading is to catch last-minute errors before your book goes live. If you’re self-publishing, proofing is an important step to add final polish to your work and eliminate embarrassing errors. If your book is traditionally published, a proofreader associated with the publishing house will perform this step for you. But do I really need all of this? Most manuscripts will undergo developmental editing, copy editing, and proofreading before publication. However, you can strategically select the services you need by being honest about your strengths and weaknesses as a writer and self-editor. If you have trusted friends and family who will read your early work and provide feedback, you may be able to eliminate the need for developmental editing. If you’re confident the rhythm and flow of your work is superb but have concerns about dialogue or inconsistencies, you might benefit from medium copy editing. Regardless, you need to connect with an editor you trust. An excellent editor will not only improve your current project but will also give you the skills you need to improve everything that comes after.